Promotion Description. This promotion is sponsored by KCBD-TV, 5600 Avenue A Lubbock, TX; and FirstBank and Trust, 9816 Slide Rd. Lubbock, TX 79424 (“Sponsor(s)”). The promotion begins at 8:00 am on April 10th, 2019 and ends on May 22nd, 2019. Entries must be received by 11:59 pm on Monday, April 22nd, 2019. Promotion is void where prohibited. By entering, each entrant accepts and agrees to be bound by these promotion rules. Eligibility. No purchase necessary to enter or win. This promotion is open only to legal U.S. residents of the following counties in the station’s viewing area: Parmer, Castro, Swisher, Briscoe, Hall, Bailey, Lamb, Hale, Floyd, Motley, Cottle, Cochran, Hockley, Lubbock, Crosby, Dickens, King, Yoakum, Terry, Lynn, Garza, Kent, Gaines, Dawson, Borden, and Scurry, who are 18 years of age or older at the time of entry, who are 18 years of age or older at the time of entry. Employees and immediate family members of employees of Raycom Media, Inc., KCBD-TV, the other Sponsor(s), and their respective parent companies, affiliates, subsidiaries, agents, and their advertising and production agencies are not eligible to participate in this promotion. Only one entry per business/individual will be accepted, and multiple entries will be disqualified. In the event that a current KCBD advertiser wins, the $20,000 grand prize must be used in addition to current annual spending amount. Previous years’ winners are ineligible to enter again. How to Enter. There is 1 way to enter this promotion. 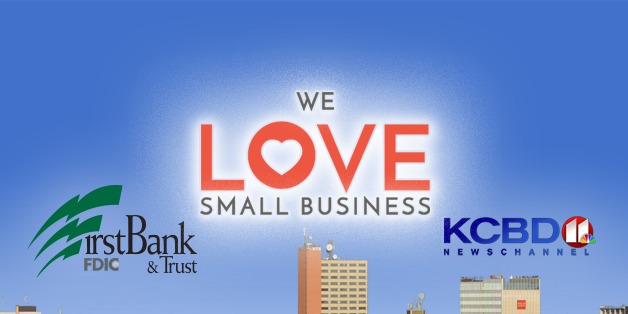 Beginning on April 10th, 2019 at 8:00 am, individuals can log on to www.kcbd.com/welovesmallbusiness and complete the online entry form for a business. Entries must be received by 11:59 pm on Monday, April 22nd, 2019 in order to qualify. All entries become the property of Sponsor(s), and Sponsor(s) reserve(s) the right to use any information submitted by entrants. By entering this promotion, entrant agrees that KCBD-TV and the other Sponsor(s) of this promotion may provide entrant with promotional materials and that KCBD-TV may release entrant’s personally identifiable registration information to the other Sponsor(s) for that purpose. KCBD-TV is not responsible for the use of entrant’s personally identifiable information by the other Sponsor(s). By entering this promotion, entrant agrees that any info provided by the entrant, along with any info from a company’s website/ social media, may be used publicly throughout the campaign. Prize(s). The business with the most votes at the end of the final 4 phase will receive a multi-platform advertising package with KCBD valued at $20,000. In the event that a current KCBD advertiser wins, the $20,000 grand prize must be used in addition to current annual spending amount. How the Prizes are Awarded. After the initial entry period (April 10th, 2019 – April 22nd, 2019) a committee consisting of FirstBank & Trust & KCBD representatives will narrow the entries down to 11 semi-finalists. 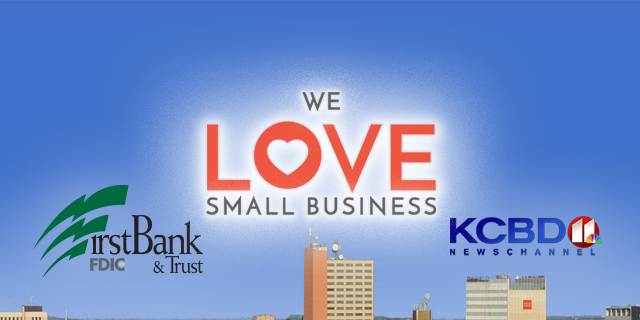 From April 25th – May 5th, viewers will vote for the small business they think deserves the advertising grant. The 4 semi-finalists with the most votes progress on to the finals. From May 10th – May 20th, viewers will vote for the grand prize winner. Conditions of Acceptance of Prize. Driver’s license or other appropriate picture identification is required to claim a prize. A winner must spend the $20,000 within 12 months of receiving the advertising package. Winner(s) will be solely responsible for any and all local, state, and federal taxes, as well as license and registration fees, transportation costs, gratuities and other items of an incidental nature. KCBD-TV will report any individual winnings over $600 (in cash or fair market value of goods or services) in a one year period to the Internal Revenue Service. Winner(s) will receive a Form 1099 from KCBD-TV if KCBD-TV reports any winnings to the Internal Revenue Service. Each winner agrees to the use of his or her name and likeness in publicity without any additional compensation, except where prohibited by law. By entering this promotion, each winner acknowledges that KCBD-TV, and all other sponsors and venues, have the right to publicize and broadcast each winner’s name, voice, and likeness, the fact that he or she won, and all matters incidental thereto. Limitation on Liability. By entering this promotion, each entrant forever discharges and releases Sponsor(s), its/their parent companies, subsidiaries, affiliates, and their respective directors, officers, employees, and agents from any and all liability, claims, causes of action, suits, and demands of any kind arising from or in connection with the promotion, including, without limitation, responsibility for property damage, loss of life, or personal injury or death resulting from or in connection with participating in the promotion or from or in connection with use or receipt of the prize(s), however caused. Sponsor’s Reservation of Rights. These official rules are subject to modification by KCBD-TV. In the event of a dispute, all decisions made by KCBD-TV are final and binding. Sponsor(s) reserve(s) the right, in its/their sole discretion, to disqualify any person who tampers with the entry process or the operation of Sponsor’s/Sponsors’ web site(s), or who otherwise acts in violation of these official rules. Sponsor(s) further reserve(s) the right, in its/their sole discretion, to cancel, terminate, or modify this promotion if, for any reason, the promotion is not capable of completion as planned (including, but not limited to, for the following reasons: infection by computer virus, technical corruption, force majeure, or non-authorized human intervention that compromises or affects the administration, fairness, integrity, security, or proper conduct of the promotion). List of Winners. For a list of winners, send a self-addressed stamped envelope to KCBD-TV 5600 Avenue A Lubbock TX 79404. 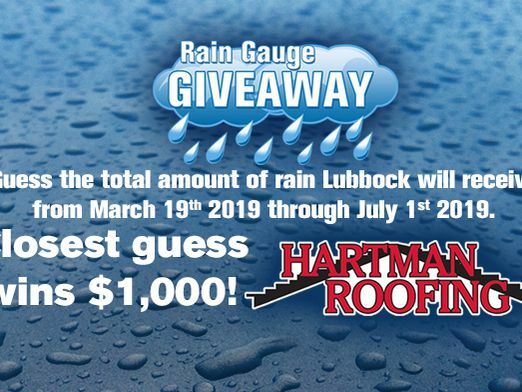 Enter now for your chance to win $1,000 from Hartman Roofing! Guess how much rain Lubbock will receive between March 19th-Jul 1st, 2019. Closest guess wins! 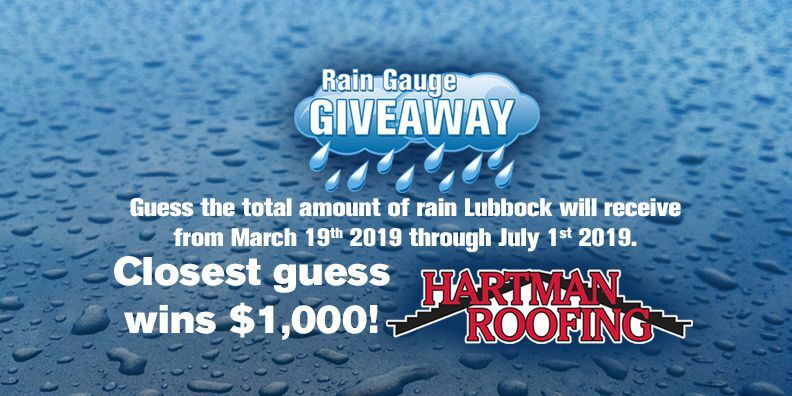 Daily winners are announced during the 10pm news every night beginning April 3rd, 2019, and will each get a free First Alert rain gauge!